Red Heart Super Saver: Soft Navy, Cherry Red and White I'm not sure how much was used since they weren't new skeins but maybe 1.5 red and 1.5 white and 2 blue? 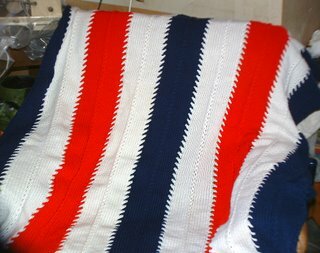 There are 9 panels I started with the center panel which has the eyelet on both sides. With Soft Navy, e-wrap CO 20. 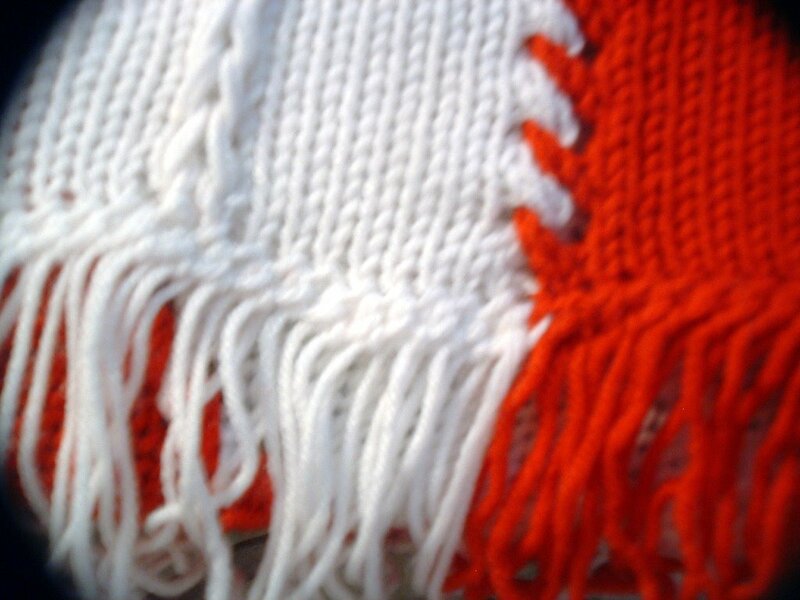 Knit 4 rows and transfer the 2nd stitch from the end to the next stitch over to create 1 eyelet on each end. Make the eyelet on each side every 4th row for 355 rows. Knit 4 more rows for a total of 359 rows and knit onto 6 rows of waste yarn. Unravel 2 center stitches and mock cable by using a crochet hook (I used an I hook) to latch up the "run" you just unraveled. Begin at the CO edge and twist 3 bars of yarn around hook to make the loop you will draw the next 3 bars of yarn through. Continue this up the panel until you reach the waste yarn. Rehang all the live stitches and bind off. You will want to be sure your loop is on the stockinette side otherwise your mock cable will be on the purl side of your panel. 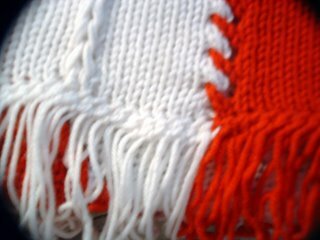 With White, e-wrap CO 20 and knit 4 rows. Using the eyelet join method attach the white panel to the Navy. You will have the join on one side and create the eyelet on the opposite side to allow you to join the next panel. I love this pattern but am a little lost on the eyelet joining. Do you have a site to explain this to me step by step?